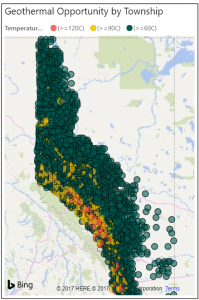 Which Alberta oil & gas wells have geothermal potential? With the support of the Alberta Government, CanGEA commissioned a study to illustrate the size of the opportunity to co-produce geothermal energy from existing Oil & Gas wells in Alberta. With the goal of better public awareness and engagement with these results; CanGEA worked with Fuzeium to create an interactive experience to complement the report. A pair of interactive dashboards was created; enabling the general public to easily connect with the results of this study and imagine how geothermal co-production could impact and benefit their communities. Over 60,000 oil and gas wells in Alberta have the potential for geothermal production. For access to the dashboards, please contact the Canadian Geothermal industry association, CanGEA.